I have a secret love affair with bridges. What makes bridges fascinating for me? They evoke nostalgic feelings. They tell stories. They provide a connection to a world of possibilities on the other side. Plus, they make excellent photographic material. Here’s a collection of Texas Hill Country bridges that we think are worth a moment of your time. The Pennybacker Bridge in Austin crosses the glimmering waters of Lake Austin, connecting the north and south sections of the Capital of Texas Highway. 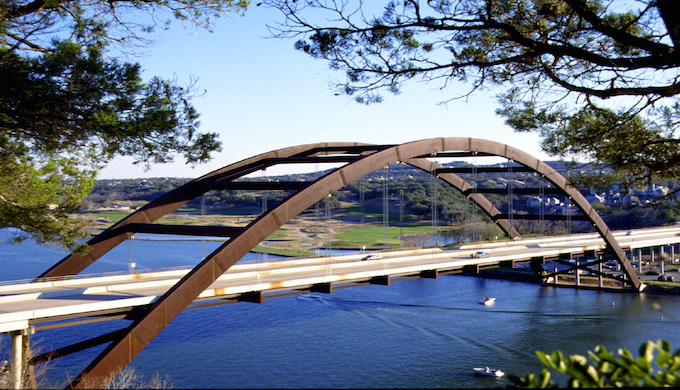 The bridge completed in 1982 honors Percy V. Pennybacker, Jr., a pioneer in welded structure technology and a bridge designer for the Texas Department of Highways. 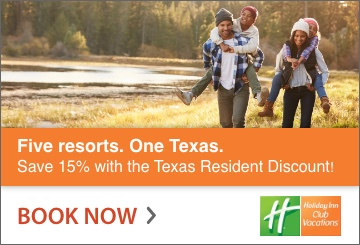 Popular hiking trails on the north side of the bridge provide beautiful views of Lake Austin. 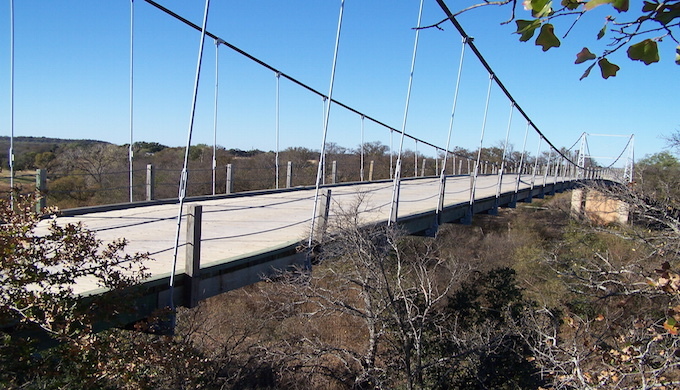 The “Swinging Bridge” crossing the Colorado River and connecting San Saba and Mills counties originated in 1903. The bridge collapsed in 1924 and then a flood destroyed it again in 1936. Workers rebuilt the bridge mostly by hand in 1939. Afterwards, townspeople gathered around the bridge site often meeting in the evenings for song and dance. 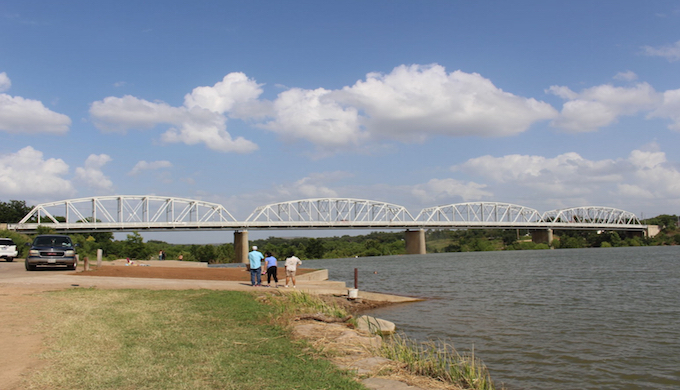 The bridge received its latest facelift in 2014 and remains the only suspension bridge in Texas open to motorized traffic. Take a little trip across this bridge. Did you feel the sway? Flood waters washed away the original structure used for crossing the Llano River near Llano in 1935. The Roy Inks Bridge, named for a former mayor replaced the demolished bridge in 1936. The bridge exemplifies the classic truss structural style popular in the 1880s until the 1930s that used materials (wood, wrought iron and later steel) to form a series of triangles that in turn absorbed stress and provided support. 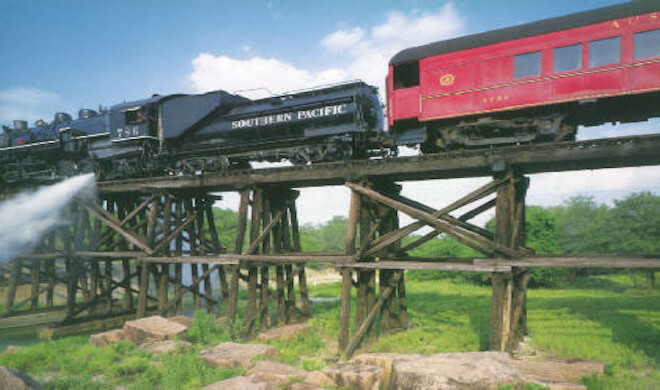 Check out this bridge the next time you’re in Llano for some great bbq.